I love the idea of video glasses – getting a large-screen or projector experience from a pocket-sized device on a plane or train is enticing. But this simple idea is a big challenge; you need tiny, lightweight, low-power, high-resolution screens and a lightweight focusing mechanism. 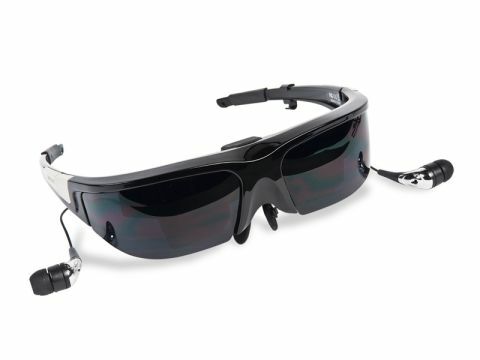 The Wrap 920 from Vuzix is the latest and most advanced in its video eyewear range, along with lower-resolution 4:3 and widescreen models, and motion-sensing models designed for video gaming. Inside the stylish wrap-around body are two 640 x 480 LCD screens, plus an adjustable focusing mechanism with stereo headphones attached. Video and power are supplied by the matchbox-sized control unit that connects to your video source via the supplied composite video and iPod adapters, or optional VGA and HDMI adapters. This also lets you adjust the volume, brightness and contrast. It weighs about 85g – about two or three times the weight of regular glasses – and feels it after a while. Despite the adjustable bridge, it tends to slip down the nose as you watch and for feature-length viewing the experience gets tiring. The focus is adjustable using a tiny screwdriver in the control box and your eyes soon relax into the experience, rather like using a pair of binoculars. There's enough room in front of your face for lightweight prescription specs, too. Another design flaw is the headphones, which attach to the front body and don't have any cable guides to keep them tidy, causing tangles if you don't unplug them when not using the eyewear. Fortunately, the sound experience itself is quite high quality for in-ear headphones. Vuzix claims the Wrap 920 gives the experience of watching a 67in screen from a distance of three metres. These days you'd expect that to be a hi-def, widescreen display. Instead, it's like unboxing an old NTSC projector from 10 years ago, complete with a 4:3 picture. It looks like it's a lot more than 3m away, too, and subtitles are barely readable, so you couldn't use it as a private laptop display. Considering the viewing experience on a portable DVD player or an iPhone is as good or better, let alone a hi-res netbook or HD laptop, it's hard to see the benefit of these, unless you want to watch adult movies in a public place. A 720p resolution is surely the minimum for today's buyer, and will be welcome.